The fractal nature of law? 12 Responses to The fractal nature of law? To be fair, “fractal” does not imply “infinite divisibility” but “division in such a way that small scales are indistinguishable from large scales.” As I see it, in our system, large scale (Federal) is fundamentally different (and more powerful) than smaller scale (State) and thus does not seem exemplify fractal dimension. Thanks for clarification. You’re totally right on two counts: the definition of a fractal and the the question of scale. In addition, with fractals, there’s no stopping point, so I will have to rethink the analogy to fractals. I was actually think the same thing when I first devised this simple schema of positive law. In theory, federal regulations have the force of law, although a powerful argument can be made that the administrative state violates the separation of powers principle of the US Constitution. Also, I added a question mark to the title of this post to leave the relation between fractals and law open. I was in fact thinking that a possible fourth dimension might be Executive vs Legislative as to the origination and/or source of authority. Yes, when I discuss “sources of law” in my survey course, I subsume regulations under the “statute/legislation” category, but I find much more difficult to categorize executive orders and decrees. The problem might be that the chief executive is supposed to enforce existing law and not act as a source of law. Also, can’t the executive refuse to enforce a law if he disagrees with it? But perhaps “Executive-Legislative” is on the same axis as “Common Law”, and “Legislative” might be equivalent to “Statute”. So that axis might either be called “Executive – Legislative – Popular” or “Decree – Statute – Common Law” depending on whether one is describing the producer or the product. OK, my last comment on this. If one were to capture the right dimensions, one could ideally position all sorts of “systems of law” into this multi-dimensional space, such as intra-family authority, Biblical and Koranic law, corporation “code of ethics” for employees… etc. It might be a chore to go through the process of characterizing all these various systems, but it could be enlightening to students of law to see what makes US law different from other systems. I very much appreciate these comments, as blogging (like writing and thinking) can be such a solitary pursuit. In any case, I think we are onto something here. All systems of rules (whether it be the game of Monopoly, the 17 rules of soccer, the United States Code, the Ten Commandments, etc.) have to share some “family resemblance”, to borrow Wittgenstein’s beautiful phrase. 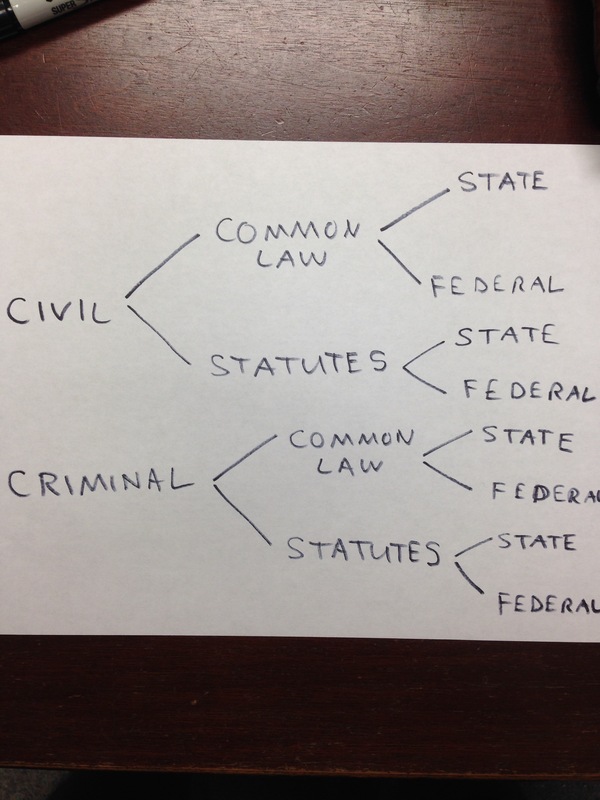 One more thing: I just realized that one possible clue as to the fractal and possibly circular nature of the sources of law is that we could start this diagram with any of the basic legal categories. For example, instead of starting with the civil/criminal divide, we could start with the state/federal divide or the statute/common law divide! That is what makes these distinctions more like *spatial dimensions* than *divides*, IMO.